The unique design of the Skin Illustrator Rescue Palette is based on the Flesh MasterTM Color system, designed by makeup artist, visual effects designer, instructor and former Face Off contestant, Rod Maxwell. The colors can easily be applied with a brush or mascara wand (palette cells may be too small to apply color with a sponge). 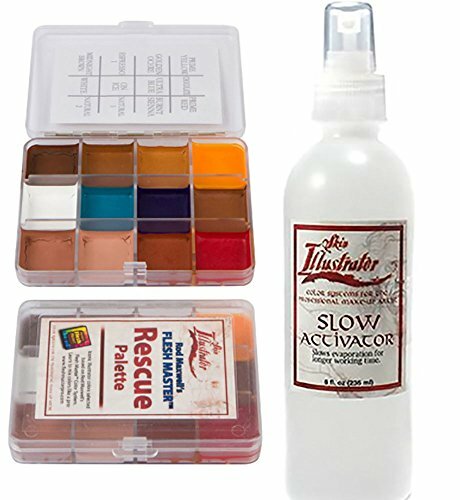 Use it alone, or mix the colors with any of the other Skin Illustrator tones to create your own unique blend of color. You must use Skin Illustrator Activator, Skin Illustrator Slow Activator, or 99% alcohol to activate the color pigment. Do Not use 70% alcohol, MEK, acetone, water or any other solvent. 8OZ SLOW ACTIVATOR AND ON SET PALETTE RESCUE ARE INCLUDED IN THIS BUNDLE. If you have any questions about this product by Skin Illustrator, contact us by completing and submitting the form below. If you are looking for a specif part number, please include it with your message.